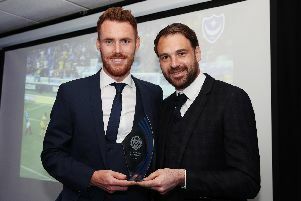 Joe Mason completed the final piece of Pompey’s summer recruitment jigsaw yesterday. The striker has moved to Fratton Park on loan until January. Mason becomes Blues' 10th signing of the summer – and fourth on a temporary basis. And there will be pressure on him to deliver. Manager Kenny Jackett has been chasing a marksman throughout the summer, with a move for Mo Eisa, in particular, failing to materialise. Meanwhile, Mason has been identified as an upgrade on former fans’ favourite Conor Chaplin, who departed for Coventry on Thursday. With all that in mind, there’s a certain expectation surrounding the Plymouth-born ban to hit the ground running at PO4. Assessing his goal-scoring record, Pompey have landed themselves a marksman who seemingly will bolster their chances of promotion. Although he was surplus to requirements at Premier League Wolves, the 27-year-old is a proven goalscorer at Championship level. And that suggests he should swiftly make an impact in his new League One surroundings. From 185 appearances in the second tier, Mason has scored 42 times. His best season came during the 2011-12 campaign when he finished with nine goals from 39 appearances for Cardiff City. Mason was also on target in the Bluebirds' League Cup final defeat to Premier League giants Liverpool that season. He displayed good movement to lose Reds left-back Jose Enrique and kept his cool to beat Spain international Pepe Reina and open the scoring at Wembley. Mason also struck nine times during 2015-16. During the first half of the campaign for Cardiff, he registered six times from 23 appearances. That led to Wolves moving for the Plymouth-born talent in January 2016 when Kenny Jackett was boss. Mason joined the Molineux outfit for a reported fee of £3m and netted a further three times in 16 matches. Given how he's performed in the second tier, the forward will be aiming for a similar, if not better goalscoring return at Fratton Park in terms of goals per game. Mason has only spent a solitary season in League One during his career. That came when he was a second-year professional at Plymouth in the 2010-11 campaign. Despite his inexperience, he scored seven times from 34 matches, earning himself a switch to Cardiff the following summer. Now 27, the striker is entering the prime of his career. And dropping down to the third tier could see Mason hit his zenith at Pompey.